Campsmount Academy has been working in partnership with HeppSY+ to create a new ‘Student Hub’. The Student Hub has been designed to encourage and raise aspirations, as well as support students in planning and considering what comes next in their educational journey, both at Campsmount and beyond. The hub will provide students with information about Post 16 opportunities at Campsmount, as well as opportunities at other further education and higher education providers. The space draws on the idea of a Student Union at a university or college, with designated areas for different activities to take place. The students at Campsmount have chosen how the space will look and how it will be used. 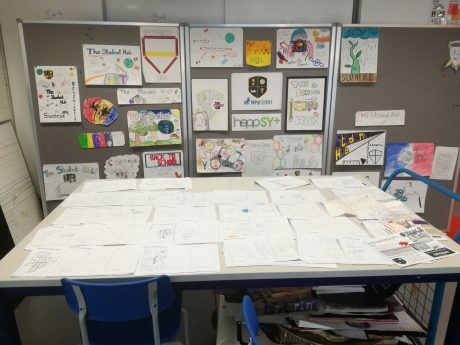 As part of the launch of the new Student Hub Year 9 Art students were asked to design a new logo and notice boards for the different areas in the hub. They were set a brief by their HeppSY+ Higher Education Engagement Assistant and the art staff at Campsmount. 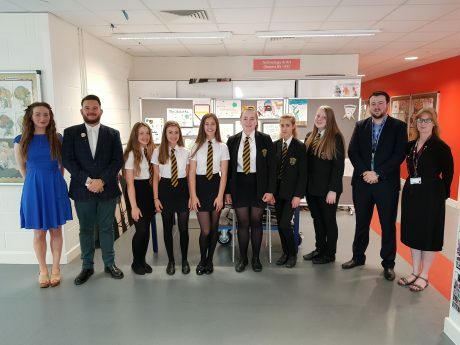 Working both individually and in teams the students set about researching and developing their ideas, before presenting them to the Principal, Mr Dale, and to HeppSY+ Programme Manager, Sharon Woodward-Baker, on Wednesday 27th June. After much deliberation three designs were awarded 1st, 2nd and 3rd prize with the winning students behind the designs being awarded £30 Amazon vouchers for their efforts. Funded by the HeppSY+ project the winning designs will now be produced by the students, creating an appealing place for other students to visit and use. The ’Student Hub’ has now begun to take shape and will continue to grow and become part of Campsmount. As well as an appealing space for the students, it is also a Legacy of the impact that projects like the HeppSY+ programme have. We will keep you updated regarding the progress of the ‘Student Hub’.